The design team at Wild Bloom is creative, educated, and experienced at designing landscapes to fit almost any criteria. With our extensive knowledge of plants, hardscape design, outdoor living environments, and the latest in sustainable landscaping techniques, we design unique landscapes that bring lasting beauty to any garden space. The design process begins with an in-depth questionnaire and consultation with a Wild Bloom designer. The designer will ask detailed questions about colors, plants, themes, shapes, how you use your space, and more, to be sure that your design is custom tailored to fit your needs and objectives. 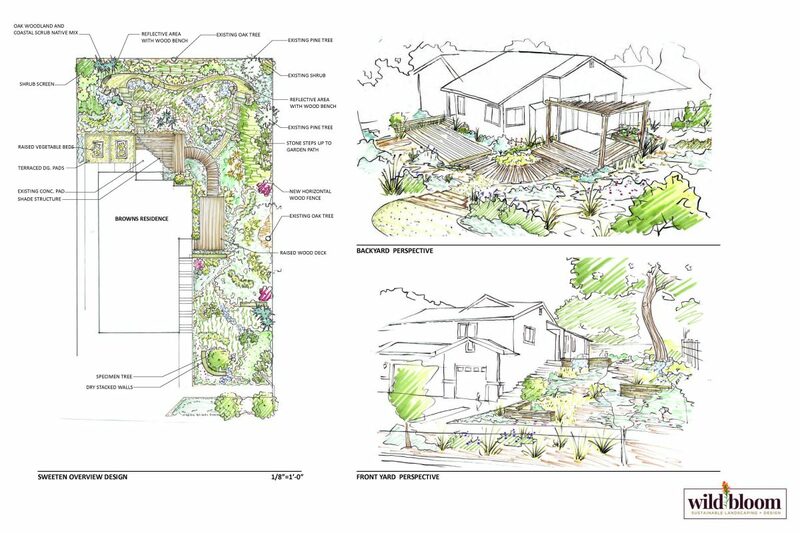 After the consultation, the designer will get to work on drafting your landscape plan. They use the information that was obtained during the consultation, along with their expertise and artistry, to create a fully thought-out design for your new outdoor space. During this time, we will continue to work closely with you as the designer creates a beautiful customized plan for your landscaping project. The design process really is all about you and about making your vision a reality. The completed design includes overhead plans, perspective drawings, a plant palette, and depending on the design may include separate sheets for hardscape plans, cross sections with construction specifications, and materials selection. You will also receive a proposal that includes a detailed scope of work and pricing information. Our goal is to guide you through this process and to deliver plans that will be the framework for a successful, well-built, professionally designed landscape. Rather than opting for a separate designer and contractor, you will get many benefits from hiring a company that has the capabilties to perform both the design and construction of your landscaping. Often, when using separate firms for design and installation there are issues that arise when transitioning into the construction phase. The designer no longer has direct control and communication with the ones building the landscape, so parts of the vision can become lost in translation. By working with one company from beginning to end your experience will be more seamless and the resulting landscape will be true to the vision of your designer. Think about your personal style, the style of your home, and landscapes you’ve seen that have stood out to you. What style of landscape suits you the best? Mediterranean? Modern? Natural? There are many different themes that can be used in your design, and we will help you narrow down the choices to find a style completely customized to your tastes. How will your new landscape be used? Considering the potential uses for your new outdoor space will help shape your landscape design. Looking for space to relax with friends and family? Want to be able to cook and enjoy dinner out on your patio? Maybe you just want your yard to look lovely from the street or while gazing out the windows? 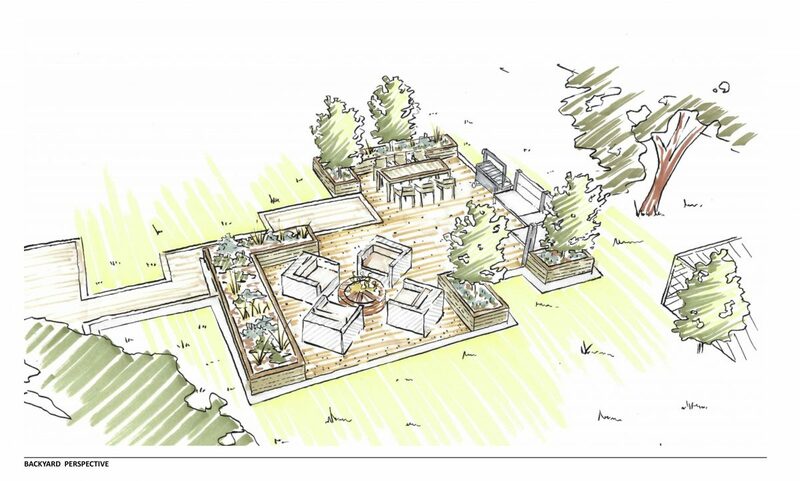 Whether you want to grow vegetables or designate an area for kids to play, being able to communicate how you foresee the landscape being used will help your designer create an outdoor space that meets your unique needs. Do you have photographs of landscapes you admire? Photographs are a great way to give your designer a sense of what you want to achieve. We always welcome your inspiration and ideas. Looking at photos online is also a helpful way to get excited about your project and identify landscape features or styles you love. Do you have a budget range in mind for your landscaping project? This question can often be challenging to answer – especially if you’ve never renovated a landscape before and don’t know where to start. New landscape installations range dramatically in price, so understanding your budget will help us provide better design advice. At a minimum, determine budget parameters, such as less than $10,000, $10,000 to 20,000, $20,000 to $30,000, $40,000-$50,000, and so on. Are there any particular plants, colors, or textures you enjoy? Designing landscapes is a creative process because there are limitless ways to create beautiful outdoor spaces. Knowing any specific plants, colors, or textures you prefer gives us a starting point to shape your design. Understanding your taste is important to us because we want you to truly love your yard. What mood do you want your landscaping to evoke? Landscapes can convey many different moods form serene and tranquil to comfortable and inviting for guests. Whether you’re into bold colors or muted tones, our designers will collaborate with you to craft custom designs intended to evoke any mood you choose. At Wild Bloom, we want you to feel right at home in your new landscape.